This afternoon, I was introduced to Cloud Mario while traveling around on a gigantic, green Mario head-airship. My roommate introduced me to Super Mario Galaxy 2 on the Wii, and I waved around my controller for a few minutes as a friendly little star, collecting coins and forcing bad guys to hold still (a flaw in this: you can't destroy bad guys as the star). And yes, it's sounds incredibly trippy when you write the premise of the game on paper. 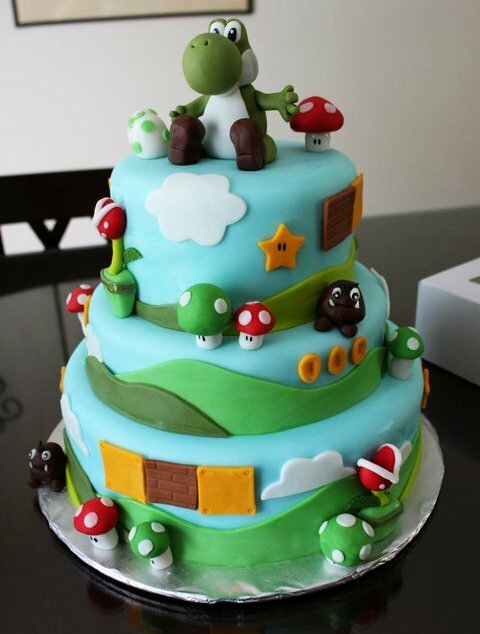 In honor of Mario and his trusty steed and sidekick, I present to you one of the cutest combinations of nerd and dessert I've seen: Yoshi as a birthday cake! Photo courtesy of Geek Art Gallery and Perfection Confection. That's such a really great cake! Would it be too cheeky to give my birthday cake contest a mention on your blog? I wish to see the future And check it out all that it presents, Enjoy your days and all they bring They joys and special things!